August 3, 2009 August 2, 2009 ~ Craig M.
Given the number of great musicians the Bay Area has lost to other cities, it’s nice when someone from Chicago or New York decides to come here. Oboeist Kyle Bruckmann has been here for a while, participating actively in the sfSound modern-classical collective. And now we get Aram Shelton. Like any creative musician, Shelton has been involved in a wide range of projects. I’ve been impressed with the trio Dragons 1976, which plays improvised jazz with hints of soul-jazz, at least to my ear, and a dryly crisp sound that I really enjoy. He’s gone into more introspective, electronics-laden territory with the duo Son of Gunnar, Ton of Shel. 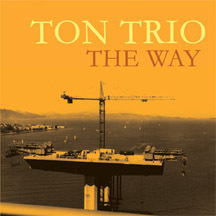 The Bay Area-based Ton Trio delivers a good, direct slice of free jazz, with thoughtful composing and terrific, energetic interplay. There’s a tint of Albert Ayler, too, especially in the title track, “The Way,” with that faux marching band proudness. Ayler seems to also be there, less directly, in “One Last Thing” and “Old Thoughts.” Maybe it’s the breed of melodicism Shelton favors. Maybe I’m just kidding myself. Getting deeper into those last two tracks: “One Last Thing” is a fine slice of free jazz, coming out calmly with an uplifting melody, then bubbling into form. Sam Ospovat hammers away on drums while Shelton and bassist Kurt Kotheimer take flight. Great stuff, with an energetic post-swing to it. “Old Thoughts” really gets into it, some hard-driving free-jazz work with a terrific drum solo. The slow songs tend to get short shrift when I’m reviewing jazz, but “Switches” really caught my ear. It opens up with a pattern that’s like gradual breathing, a slow awakening — but Ospovat’s drumming is just going nuts behind it, lots of little cymbal clashings that tell you there’s more energy building than you think. And while the piece stays rather laid-back, it does get into some gnarly bass clarinet work.